The adventure begins when Tintin buys a beautiful model ship, the Unicorn, in an outdoor market. 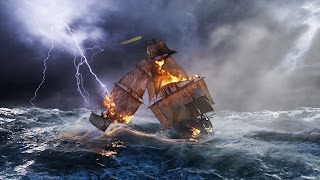 He is quickly accosted by the sinister Ivan Sakharine, who wants the ship for his own, and will go to any lengths to get it. 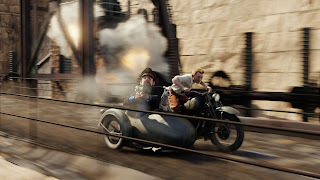 Tintin realizes the Unicorn must hold some incredible secret, and sets out on a globe-trotting investigation that introduces him to the lovable alcoholic ship captain, Archibald Haddock, as Sakharine and his men follow hot on Tintin’s trail. I went through a “Tintin” phase as a kid, reading some of the very same books adapted for this movie, and it’s a pleasure to report that Spielberg and collaborator Peter Jackson got the film just right. Not just visually – which I have so many good things to say about – but tonally and narratively as well. The screenplay, by the dream team of Steven Moffat (“Doctor Who”), Edgar Wright (“Sean of the Dead,” “Scott Pilgrim”) and Joe Cornish (“Attack the Block”) seamlessly combines three “Tintin” stories into one, respecting Hergé’s structure and formula at every turn. One of the things that made “Tintin” so fun is that while the mysteries were never exactly mind-boggling, they were engaging, expertly paced so that the secrets remained interesting, rather than burdensome. The film’s story does the same thing, while creating plenty of organic opportunities for action. The result is a movie that never slows down, throwing something fun or intriguing our way at every single turn. More importantly, Spielberg and company have perfectly captured the characters. Tintin himself has never been the most interesting protagonist on the planet, and when making the transition to film, one runs the risk of misinterpreting his calm, determined demeanor as bland. 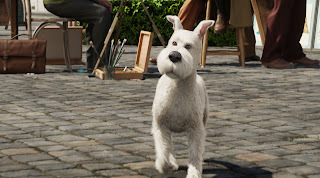 Thanks to a very strong, authentic performance by Jamie Bell, however, Tintin works very well as the center of attention, someone we want to follow on this adventure, and his good-natured, buttoned-down personality anchors the zanier temperaments of the supporting cast. 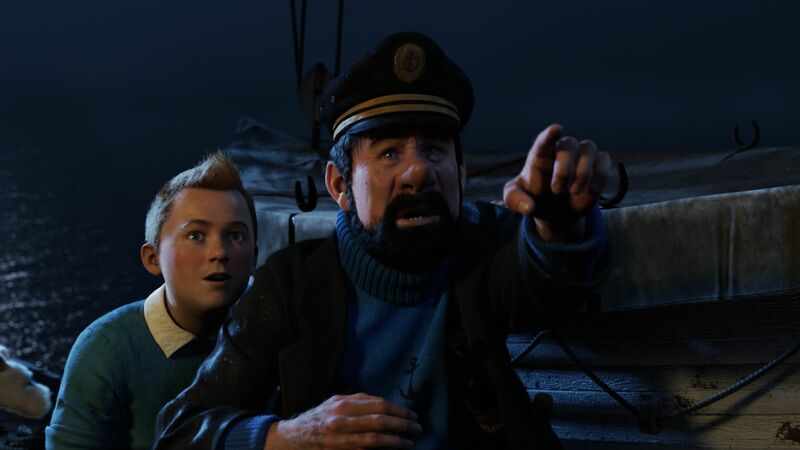 No character is zanier than Captain Haddock, but readers have always loved him for it, and Andy Serkis simply relishes the opportunity to play such a wild, yet recognizably human character. At this point, I should probably stop being amazed by the wonderful things Serkis can do through motion-capture, but his performances still blow me away. Like Gollum, or Caesar from “Rise of the Planet of the Apes,” Serkis simply melts away into the role; he simply is Captain Haddock for the duration of the movie. 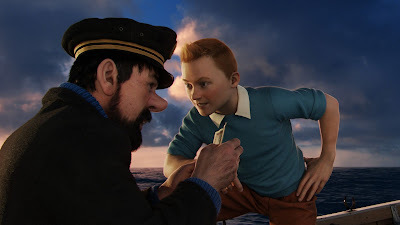 Serkis and Bell share a marvelous chemistry, just as their characters did in Hergé’s comics, and I especially appreciated how the film, probably recognizing that Tintin himself is a fairly static character, give the real arc of the story to Haddock. But no character is brought to life as well as Snowy, Tintin’s pet and investigative partner. Every single thing Snowy does in this movie is either hilarious, adorable, or more often than not, both. I got tremendous pleasure out of simply watching Snowy and Tintin walk down the street together, just as I remember them from the comics. Bumbling detectives Thompson and Thompson are brought to life with similar perfection, thanks in no small part to fun performances by Simon Pegg and Nick Frost. Finally, Daniel Craig suavely voices the villain, Ivan Sakharine, an against-type casting that works in the film’s favor. All of the characters, save Snowy, are brought to life through performance capture animation. It’s a method I’ve felt has never worked well for humans (look to “Beowulf” or “Polar Express” for the supremely creepy results), but has always looked splendid for characters like Gollum, King Kong, or the Na’vi from “Avatar.” “Tintin” may feature the best use of the technology to date, as it is expertly employed to turn Hergé’s drawings into living, breathing creations. Tintin, for instance, still looks like the Tintin of the comics, but instead of a cartoon, he is now ‘alive.’ It’s a hard effect to explain, but the end result is like being transported to an alternate, live-action dimension where humans look like Hergé characters. 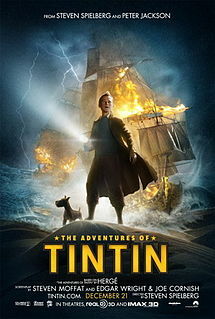 Suffice it to say, I don’t think “Tintin” could have been realized on the big screen any other way. But this is Weta Digital we’re talking about after all, a special effects house that have demonstrated time and time again that they can do pretty much anything; the only limit is the filmmaker’s imagination, and Spielberg, as we know, is one of the most creative men on the planet. “The Adventures of Tintin” is a huge step forward for the director. For the first time in his career, he has no boundaries. Any idea he has can be brought to life, and he dives headfirst into this magical opportunity. Every action sequence is simply marvelous; like the set pieces in “Indiana Jones,” they are big, sprawling, edge-of-your-seat material that push the tension as far as it can go, but the staging now exists far outside the realms of what live action allows. There’s a battle between two pirate ships that would make “Pirates of the Caribbean” sob with jealousy, and an inventive flight through a raging storm that goes in wonderfully unexpected directions. But the most impressive scene of all is a chase through the streets of Baghhar, animated in one very long, fluid take without any editing whatsoever. It feels like something Spielberg has always wanted to do, but simply couldn’t because of camera limitations. In animation, however, the camera can go anywhere, and one can practically hear Spielberg jumping up and down with excitement throughout this mesmerizing sequence. The animation itself is beautiful, and for two-thirds of the run-time, I was highly impressed by the use of 3D. It’s not groundbreaking like “Hugo,” but the extra dimension certainly draws one further into the environments. At one point, though, the effect simply turned off for me, as though Weta ran out of time and didn’t render the film’s last third for 3D. It doesn’t look bad – it just looks like a normal 2D movie, and makes me question whether or not the 3D surcharge is really worth it this time around. It’s also worth noting that I wasn’t fond of John Williams’ score. It’s very recognizably Williams, thus completing the Spielberg aesthetic, but the compositions are more or less phoned in, a lazy approximation of Williams’ swashbuckling scores like “Raiders of the Lost Ark” rather than something fresh. None of the motifs are memorable, and Williams fails to inject the proper amount of energy into sequences that could really use it. Much as I love Williams, this score is a bit of a misfire; perhaps all his creative energy went into the upcoming “War Horse,” a score I’ve heard nothing but good things about. As I said in the beginning, “Tintin” is a fairly lightweight adventure. For all of the film’s many wonderful qualities, I wouldn’t say I felt riveted, and there’s nothing underneath the surface to elevate the story to greatness. It is Hergé’s “Tintin” through and through, and since those were relatively quaint stories, this is a relatively quaint adventure film. That’s exactly as it should be, in terms of respect for the source material, but it is why, despite all the things I love about the film, I’m not giving it a higher letter grade. 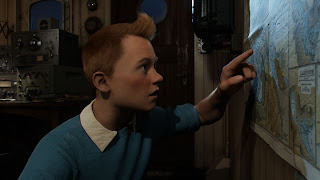 Still, in a very disappointing year for animation, “Tintin” is the best offering of 2011, and for fans of Spielberg or Hergé alike, this will be a very pleasant treat. As Saturday morning fare, one couldn’t possibly do any better. This review was originally published on December 10th, 2011; it has been reposted to coincide with the film's release.